Purchasing the "right" load cell system is critical for the application, and obtaining reliable results. Purchasing a system merely based on cost and not looking at the right specifications may result in a complete waste of capital. If the system chosen does not perform well in the environment it is being used, the resulting measurements may not be meaningful. · Does it meet my mechanical and environmental requirements? · What is the cost? · How easy is it to use? · How accurate is it? 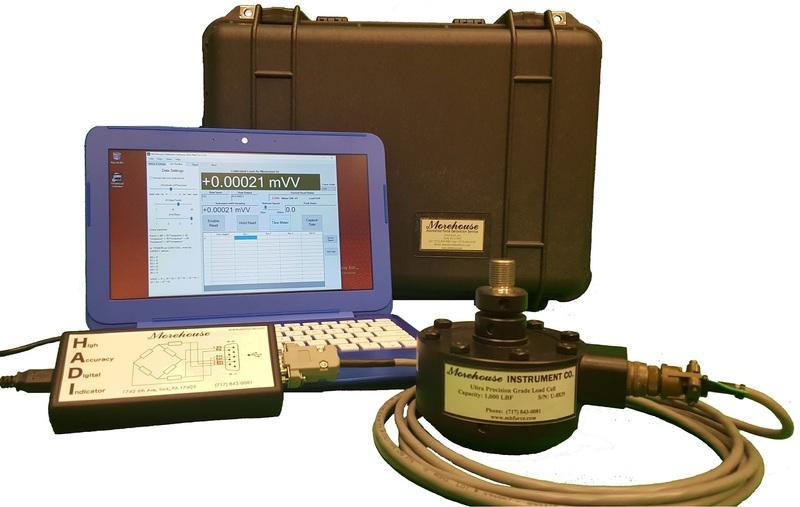 Morehouse load cell systems consists of one or more Morehouse load cells, a digital indicator, a cable, possible adapters and a quality shipping case with custom cut high density foam. When a buyer evaluates a system based on meeting requirements such as: cost, ease of use and accuracy, they often forget to look at what really matters. Buyers often get caught in marketing claims and overlook the fine print. Things that are commonly missed are environmental, side load sensitivity and stability. All of these can have a significant impact on the load cells performance and make the original accuracy claim, you know the one you read in the marketing literature, false! If the load cell is not temperature compensated, the expected performance may decrease by about 0.015 % per degree C, resulting in a decrease in accuracy. In fact, a few degrees C deviation from the calibration temperature may cause more error than the originally stated accuracy in the specs sheet. Side load sensitivity (eccentric loading) may have the most significant impact on the expected performance of the system. Morehouse has done several tests and demonstrated side load sensitivity can vary from 0.002 % on a Morehouse load cell system up to 0.75 % of full scale on some other load cells. Depending on the load cell application and mechanical design of the system, off-center loading can simply happen even if all loading points and adapters seem to be in line. If you are buying a load cell with a 0.5 % accuracy specification, do you think it is really accurate when the slightest bit of off-center loading, produces a 0.75 % error? The final specification, often neglected is stability. Stability will have a significant impact on your cost of ownership. If the system is not stable, it will require more frequent calibration. More frequent calibration means higher lifetime cost of ownership. It is not uncommon to compare a $ 1500.00 system with a $ 3,000.00 system and have the lifetime cost of ownership end up being closer to $ 10,000.00 versus $ 5000.00. The only way to address these issues is to educate the customers. In an effort to educate the end buyer, we have developed videos, training classes, webinar and often do several speaking engagements per year. The videos and training material can be found on our website www.mhforce.com. Inform the buyer on what matters by educating them. Have them start asking, how well does it actually accomplish the measurement for my application? Try to persuade the buyer to purchase based on overall value and not the upfront cost alone.